I heard today of the untimely passing of artist extraordinaire Mike Weiringo, and it just hit me on so many levels. Not only was Mike a terrific artist, but he was a decent guy, and in the prime of life. And just like that he's gone. Life is full of surprises. 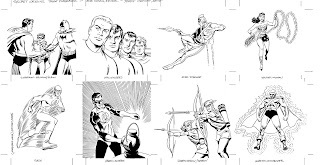 I was reminded by Mike Carlin today that Mark Gruenwald passed on at the same age (44) and the same day (August 12th) eleven years ago. It sounds trite to say, but it is a reminder that every day of life is precious. I know that Ringo's work will live on, in collected editions, just as Mark's work does, which is some consolation. 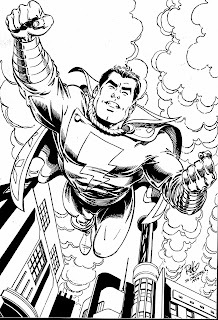 This Captain Marvel piece was pencilled by Ringo and inked by me, for DC's 1994 presentation catalog, when Mike was briefly attached to draw the monthly Power of Shazam comic. Sadly, he withdrew from that project. I would've enjoyed working with him on that. He had grown so much as an artist since then, peaking with his work on his project Tellos, and his recent runs on Fantastic Four and Spider-Man. What a terrific storyteller he was , with clear, easy to follow stuff. His pencils elevated every script he worked on, and he will be missed. Labels: Mike will be missed. 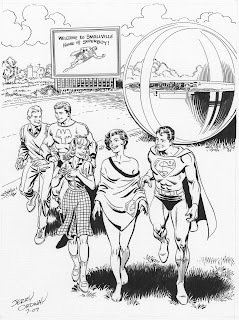 I drew this for a reprint of the original 1960's Secret origins comic, where the original stat was too degraded to use. It was an awful fun job, and I couldn't hide my style too much, though I tried to respect the panels ( which were drawn by several artists originally.) It was more than a tracing job, I can tell you. I believe the World's Finest panel had the most redrawing, by DC editorial request.